As I was doing my manis over the last week using the polishes from the Zoya Ornate Collection, I was sure to capture a swatch of each one. I thought I'd combine them all into one bonus post. 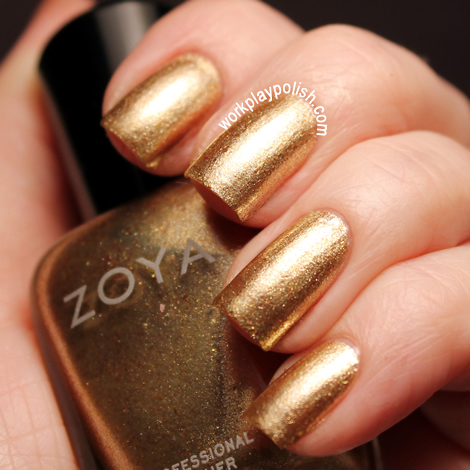 In addition to each photo, I've included the description from the Zoya site and a link to the mani I used it in. Blaze: A full coverage, cool-toned medium mulberry red with a high concentration of micro fine diamond holographic glitter. Aurora: A full coverage, medium sugarplum purple flecked with a high concentration of micro fine diamond holographic glitter. 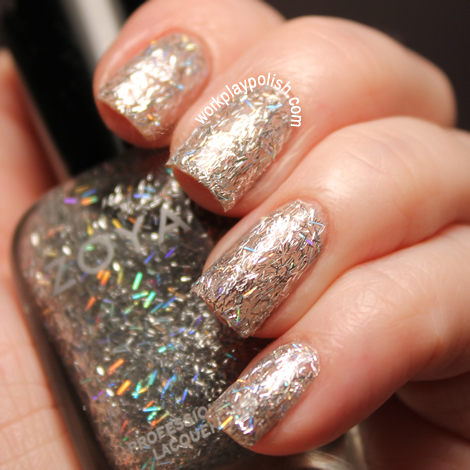 Storm: A full coverage, holiday black with a high concentration of micro fine diamond holographic glitter. Ziv: A full coverage, yellow-toned metallic gold foil with silver highlights and warm gold flake glitter accents. Logan: A full coverage, yellow-toned forest green with dense, foil-like yellow-gold and blue-green duochrome shimmer. If I had to pick favorites, it would be Blaze and Ziv. While I like Electra, it probably finishes last for me in the line-up. What are your favorites?